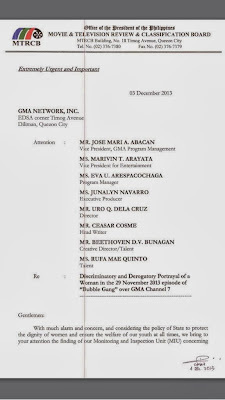 Bubble Gang, its producers and cast members Michael V. and Rufa Mae Quinto, have been summoned by the Movie and Television Review and Classification Board or MTRCB to attend a mandatory conference in their office tomorrow (Monday), December 9, 2013, at 9 in the morning. The reason? 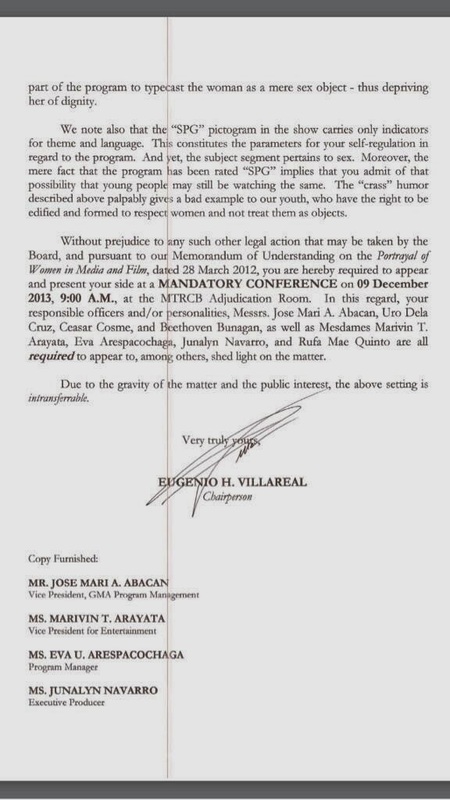 Read the scanned photos of the MTRCB ruling below, which were first posted just last night via its official Twitter account (@MTRCBgov). 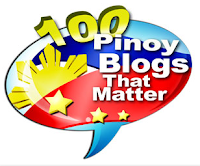 According to MTRCB, the November 29 episode of GMA 7's longest-running comedy gag show "Bubble Gang" which featured Michael V. and Rufa Mae Quinto (as Susie) in the segment "D' Adventures of Susie Lualhati". The sketch in the said segment was about how to make a "puto bumbong" which allegedly had discriminatory and derogatory portrayal of a woman. 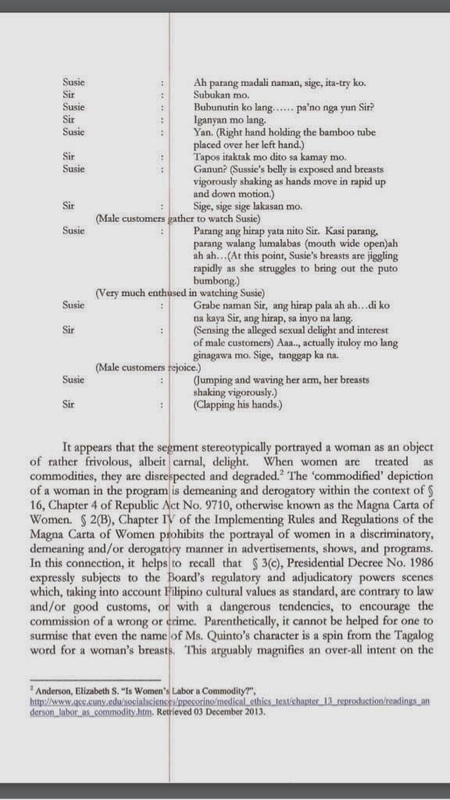 MTRCB also noted the use of "Susie" which could be a spin off from the Tagalog word for a woman's private part. 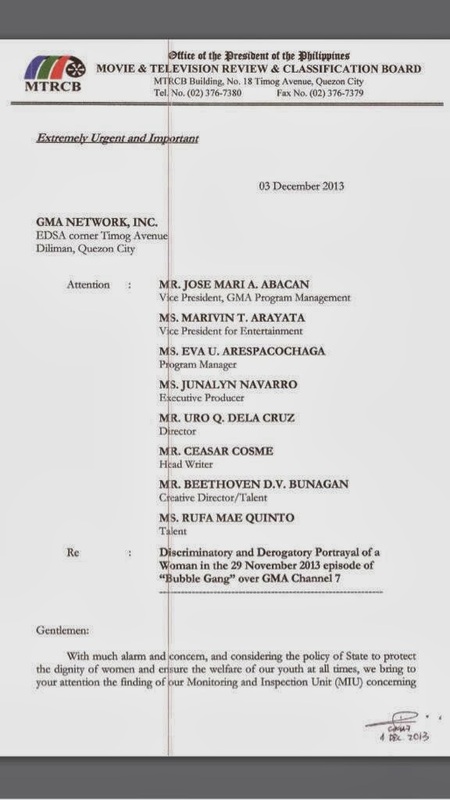 This week could be a very stressful week for GMA Network, 'coz a day after Bubble Gang's conference with MTRCB, it's "Unang Hirit's" turn to meet with the regulatory board concerning its episode last November 5, which featured controversial interview of its anchor Arnold Clavio with Janet Napoles' lawyer, Atty. Alfred Villamor. 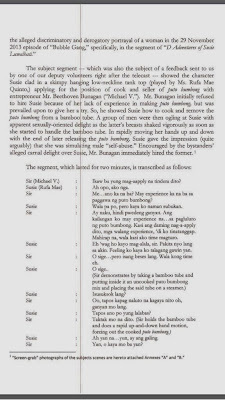 Remember Clavio's rude lines against Villamor when he failed to extract more infos from the lawyer? "Panira ka ng araw eh! Tatawa tawa ka pa"
MTRCB ruled that there was an alleged offensive, disrespectful language and behavior in Clavio's interview with Napoles' counsel. "Unang Hirit and Mr. Clavio would have been able to treat Mr. Villamor with more respect and courtesy," says MTRCB in its ruling. 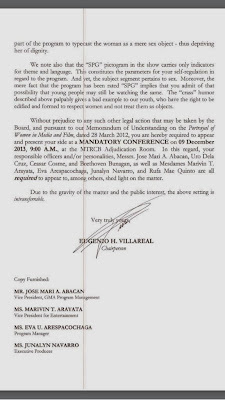 Thus, executive from the network, Unang Hirit producers, director, writers, staff, Arnold Clavio and other public affairs hosts have been ordered by MTRCB to undergo a mandatory seminar on media and the legal profession this Tuesday and Wednesday (Dec. 10 and 11), 730AM to 1030AM, at the MTRCB conference room.